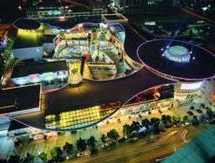 Marking a new era in Shenzhen’s entertainment development, Coco Park is a mall that combines shopping,art, dining, entertainment and sightseeing. The park’s bars are open 24-7 and there is never a shortage of nighttime activity. It’s one of the city’s most popular entertainment hotspots. Address: 3 Fuhua Road, Futian District, Shenzhen. 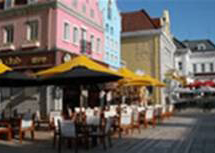 Located in Window of the World Park, a visit to this authentic European style bar street gives you a taste of each featured nation’s unique culture. Address: Shennan Road, Nanshan District, Shenzhen. Transportation: Subway Line 1 or Line 2. Get off at Window Of The World Station. 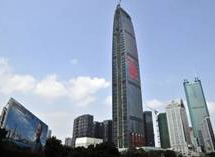 The 384m-high Shenzhen Diwang tower is one of the tallest landmarks in Shenzhen. 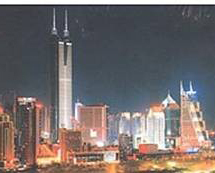 The first high-rise sightseeing and entertainment tower in Asia, the building was officially opened on September 28, 1999. To date, it has welcomed nearly three million visitors. Transportation: Subway Line 1 or Line 2. Get off at Grand Theatre Station, Exit D.
This 100-floor mixed-use building rises to 441.8m. Sixty-eight floors are dedicated to Class A office space and 22 to a six-star business hotel. The top four floors house a garden and several restaurants. The building's lower levels feature KK Mall, which opened on November 26, 2010, and is home to luxury brand stores, restaurants and a supermarket. KK Mall also houses Shenzhen's first IMAX cinema.The St. Regis Hotel occupies floors 75 to 98 of the main tower, which opened in September 2011. It is currently the tallest building in Shenzhen, 9th tallest in the world. Address: Shennan Avenue.5016 Luohu District Shenzhen. Transportation: Subway Line1 or Line 2, Grand Theatre Station. 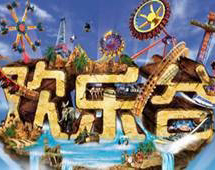 Shenzhen Happy Valley is a large modern theme park in Nanshan District. Spanning 350,000 sqm, the park boasts numerous breathtaking rides and activities. It is split into nine theme zones: Spanish Square,Cartoon City, Mt. Adventure, Gold Mine Town, Shangri-La Woods, Sunshine Beach, Typhoon Bay, Playa Maya Water Park and Happy Times. Transportation: Subway Line 4 or Line 1, get off at Window of the World Station. Known locally as the "Hawaii of the East", Xiaomeisha, which lieseast of Dapeng Bay, about 30km from downtown Shenzhen, is the largest seasideresort in the city. 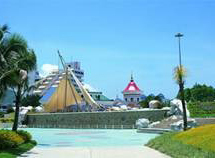 It features a vast white beach, Sea World, water sports,accommodation, catering and shopping facilities. The beach lies at the base ofa hill and is surrounded by lush tropical forest. Days spent here aredelightful breaks from the concrete maze of downtown Shenzhen.